End of the Great Cycle and Postcards from hell. A picture for the kids to color. End of the world project and all that. This was my main interest today the AP report on the discoveries of Mayan cavern temples and now I am finding it a little hard to sleep because of it – I keep thinking mabey this is what the Mayans were trying to warn us about and that the end of the world according to their calendar on Dec. 12 – 23,2012. Mayan Hell is unleashed. Its all very HP Lovecraft. I remember the 1987 “end of the world fever” it was quite odd. The 13 Heavens and 9 Hells were each 52 years long (1,144 years total). Each of the 9 Hells were to be worse than the last. 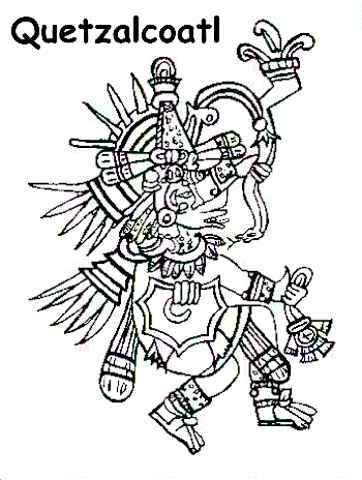 On the final day of the last Hell (August 17, 1987), Tezcatlipoca, god of death, would remove his mask of jade to reveal himself as Quetzelcoatl, god of peace. In the mythology of the Aztecs, the first age of mankind ended with the animals devouring humans. The second age was finished by wind, the third by fire, and the fourth by water. The present fifth epoch is called Nahui-Olin (Sun of Earthquake), which began in 3113 BC and will end on December 24, 2011. It will be the last destruction of human existence on Earth. The date coincides closely with that determined by the brothers McKenna in The Invisible Landscape as “the end of history” indicated by their computer analysis of the ancient Chinese oracle-calendar, the I Ching. I don’t know. I am hoping it is more of a metaphor for the change of the human spirit than about some giant multi-dimentional snake creature. There are talks about Planet X revealing itself at this time with some major planet alignments and Earths position at the Milky Ways equator. I am still upset over Pluto being made to step down. There are theories in Astrologic circles that Discovering new planets happens when mankind is ready to evolve to the next step of consciousness. So each new planet = a new step forward for human kind – so what does it say when we demote a planet? I am still fuming. Bring Pluto back you quacks. but oh so cool. Spelunking all those amazing ruins and being in those sacred places. Space both inside and outside our planet. Who doesn’t love a good mystery. I just realized this could mean cloning. I really think cloning is just so wrong.